The group behind ambitious plans to develop Hawick Moor is seeking to reassure Teries that the project will not interfere with events held there as part of the town’s annual common riding. Future Hawick’s Town of the Horse sub-group wants to develop the facilities at the St Leonard’s Park racecourse and extend its use from around nine days a year, as at present, to all 365. Future Hawick member Brian Bouglas is among those leading the Town of the Horse project. Initial proposals include landscaping the centre of the racecourse and adapting the existing building to include a cafe, toilet facilities and meeting rooms, as well as creating an indoor riding school. Speaking at Hawick Community Council’s meeting on Monday, project leader Brian Bouglas said: “We are trying to promote Hawick as the town of the horse. “The name makes it sound all about horses, but what we are proposing at the mair isn’t just for horses – it’s for everything you can do to encourage tourism. “If this works, the town of Hawick will fly because we are going to have visitors all the time, whether for equestrianism, music festivals, you name it. “We had a meeting with the director of Kelso Races, who was very keen on training courses for jockeys. The group was given £2,000 from Hawick’s common good fund towards a feasibility study, and it is currently trying to secure the additional funding required for an in-depth report to be compiled. 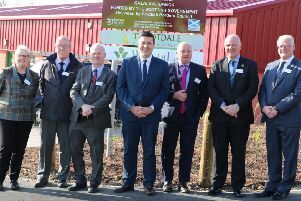 Potential funding streams for the project, estimated by the group as being likely to cost millions of pounds, include the south of Scotland economic partnership, the Borderlands growth deal and wind farm benefit funds. Committee member Colin Telfer said: “It’s a huge project and it would cost millions, but we think the mair is chronically underused at the moment, and we’ve got to have a goal. Community councillors and members of the public were largely in favour of the plans, although some felt that various issues need to be addressed. French Wight said the group should be applauded for its initiative but pointed out that there is currently very little accommodation in Hawick, and Lesley Fraser questioned how access to the moor would change for members of the public should the plans come to fruition. Concerns were also raised about the impact the project might have on the traditional common riding events that take place at the moor every June. Future Hawick chairman Derick Tait sought to allay those fears, however, promising: “This initiative will not interfere with the activities of Hawick Common Riding. “Hawick Mair is an underused facility. We are seeking to use it to boost our economy, respecting those events on the calendar which are sacrosanct. Hawick and Denholm councillor Stuart Marshall added: “Lot of issues have been raised here, and it is great because it will reassure a lot of people that the plans will not affect the common riding at the moor.